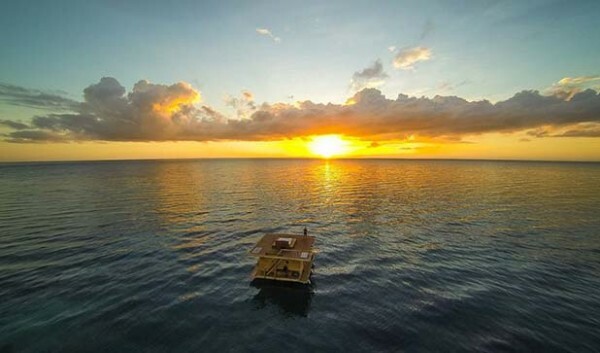 The Place: The Underwater Room is a tri-level structure floating in the Indian Ocean, about 270 yards off the coast of Pemba Island, part of the Zanzibar archipelago. 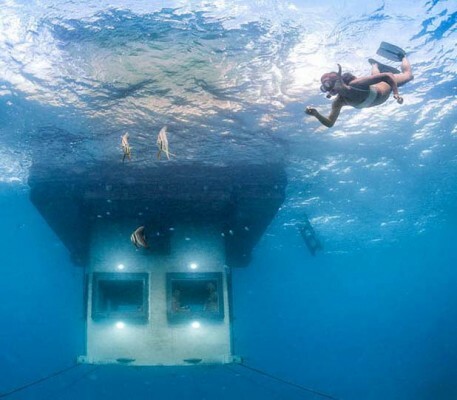 The underwater level of this sea abode provides 360-degree views of passing tropical fish, octopi, and squid with its wall-to-wall glass panes. The deck at sea level houses the bathroom and the roof level, prime territory for sunbathing during the day, and is accessed by ladder. This room is the second underwater lodging from the Swedish company that built it; the first lies below the surface of lake Mälaren, near Stockholm, Sweden. The Cost: $1,500 per night, all inclusive. The Region: Pemba Island is better known for farming and fishing than tourism, but with its diverse fish population and huge coral reef, you’d be hard pressed to find a better place in this part of the world to go diving. While the total isolation found in Pemba is its biggest draw, various sites throughout the island, like ruins dating back to the 11th century, make for prime archeological hiking on this lush land that’s covered in clove plants.